Status: Fairly common regular spring and fall migrant west and central, rare casual east. Locally uncommon regular summer visitor west and west-central, accidental east. Locally uncommon regular winter visitor west and west-central at Lake McConaughy, Keith Co and Sutherland Reservoir, Lincoln Co, rare casual elsewhere. Documentation: Photograph: 14 Aug 1986 Lake McConaughy, Keith Co (Brogie 1986; Mollhoff 1989). 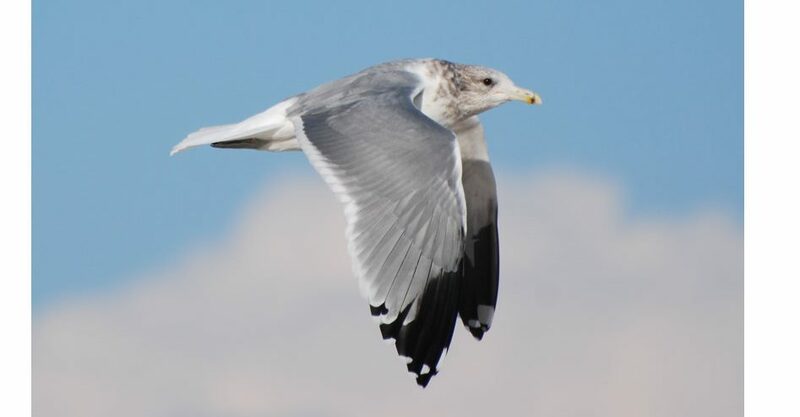 Taxonomy: There are two subspecies of California Gull (Jehl 1987, Gill and Donsker 2017), californicus, breeding locally from British Columbia south to California and central Colorado, and albertaensis, breeding in central Canada and the north-central and northwestern United States. There is a zone of overlap in Montana (Winkler 1997, Howell and Dunn 2007). Field identification of the subspecies is difficult (see Comments). Early dates cited above are at locations where wintering birds were not reported, and late dates are away from Lake McConaughy, where a few have summered in recent years. There are earlier reports 19 Feb 2017 an adult at Lakes North and Babcock, Platte Co, three on 26 Feb 2012 at Johnson Lake, Dawson/Gosper Cos, and 4 Mar 2015 Lincoln Co.
Reports away from Lake McConaughy are more numerous in spring than in fall; the 38+ such reports (as of Jun 2018) are distributed statewide 8 Mar-30 May. Most migrants in Nebraska are presumed albertaensis. In 2014 reports were indicative of a surprising influx in eastern Nebraska of birds of all age groups, although many of the reports, unfortunately, were not supported by unequivocal photographs, particularly of birds in flight. The reports follow (Silcock 2014): Good photos were provided of a second-cycle bird first seen at Carter Lake, Douglas Co 13 Mar; presumably the same bird was reported there through 12 Apr. An adult was in Dakota Co 20 Mar, one was in Sarpy Co 3 Apr, and another was photographed at Pawnee Lake, Lancaster Co 5 May. An immature was photographed at Carter Lake 29 Mar, and presumably the same bird was there through 4 Apr. High counts: 82, mostly adults, at Lake McConaughy 22 Apr 1994, and 27 there 17 Apr 1997. Summer: Breeding occurs close to Nebraska at several sites in northeastern Colorado; no estimate of breeding pairs was given by Wickersham (2016), but up to 1500 pairs of the nominate race were nesting at Riverside Reservoir in Weld Co around 2000 (Mark Robbins, pers. comm.). Breeding also occurs in northern South Dakota (Tallman et al 2002). In Colorado, islands are used for nesting (Andrews and Righter 1992); the lack of islands at Lake McConaughy may obviate breeding there. Because of the proximity of these breeding colonies to Nebraska, we presume that most summer records at Lake McConaughy are of californicus. Midsummer reports in Nebraska, those in the period 3 Jun-17 Jul, are few and recent; since 1995 at least one bird has been reported each summer at Lake McConaughy; age classes are of interest, and suggest presence of failed breeders and non-breeding immatures. The 21 counted there 20 Jun 2004 consisted of eight adults, 11 second alternate, and one first alternate-plumaged birds, and the 30 on 21 Jun 2005 included 19 adults, six second-alternate, and five first-alternate birds (Stephen J. Dinsmore, pers. comm.). Reports prior to 1995 at Lake McConaughy are 13 Jun 1987 an adult in Keith Co, presumably at Lake McConaughy (Williams 1987), and 15 Jun 1991, a mixed age flock of 10. Away from Lake McConaughy, the few mid-summer reports are all in the west except for a “near adult” at Branched Oak Lake, Lancaster Co 15 Jun 2002. The Panhandle reports are: two on 3 Jun 2010 and 13 Jun 2010 at Crescent Lake NWR, Garden Co, 15 Jun 2005 second alternate photographed at Lake Minatare, Scotts Bluff Co, 16 Jun 1996 mixed age flock of 23 at Harrison, Sioux Co, 16 Jun 2007 immature Oliver Reservoir, Kimball Co, and three on 8 Jul 2006 Valentine NWR. The single eastern record cited is probably an immature non-breeding albertaensis, but the remainder are likely wanderers from Colorado, as suggested above for summering birds at Lake McConaughy. Late dates above are away from Lake McConaughy. Numbers of California Gulls increase at Lake McConaughy during late summer, with the first arrivals noted in Jul. A good early count was a flock of 84 there 19 Jul 2003, consisting of 17 adults and the rest molting near-adults; the limited, fine nape streaking was suggestive of failed breeders and non-breeding immatures of the prairie-breeding subspecies albertaensis (Silcock 2003). Another good count of perhaps similar provenance was the 80 there on 30 Jul 2006, including 70 adults, eight juveniles, and single first- and second-alternate birds (Stephen J. Dinsmore, pers. comm.). Numbers continue to build into fall and then decrease in early to mid-winter, with sizeable numbers still present into late Dec. In recent years a few have lingered through winter (see Winter). There appears to be a later peak at Lake McConaughy in Nov, which corresponds to the timing of most eastern fall records (see below); we consider these Lake McConaughy and eastern fall birds to be albertaensis migrants. The 18 eastern records in fall are all since 1994 and in the period 26 Oct-30 Dec. The reports, where ages were given, were of adults and immatures; best count was three at Branched Oak Lake 10-14 Dec 2014. High counts: 151 at Lake McConaughy 24 Aug 2007, 148 there 4-11 Aug 1996, and 148 there 5 Nov.
Winter: Overwintering attempts apparently first occurred 1991-1992 at both Lake McConaughy and Sutherland Reservoir; an adult was at Lake McConaughy 16 Feb and three were at Sutherland Reservoir 15 Feb (Morris 1992). Similar observations were of 1-2 remaining at Lake McConaughy 19 Feb 1995, and 20 there 1 Feb 1997 but only 1 on 15 Feb. Some Feb records may be of returning birds; in 1997-98, 78 were present 1 Jan, but none 14-15 Jan, although 38 had reappeared by 7 Feb. Overwintering was first confirmed at Lake McConaughy 1995-1996, when 26 were present 28 Jan 1995 and 21 on 5 Feb 1996, but only three remained 5 Mar. Lowest numbers occur late Feb-early Mar. The only mid-winter records elsewhere are of possibly the same bird; an adult was at Twin Lakes WMA, Seward Co 27 Jan 2015, and another was at Branched Oak Lake 17 Feb 2015. Comments: Identification in the field of the two subspecies is difficult. According to Tony Leukering (post to COBIRDS), “the only character that allows fairly certain differentiation of subspecies, and this ONLY on full adults, is the precise wing tip pattern (Pyle 2008): californicus has black on outer primaries extensive, that on outer web of p7 occasionally (~13% of individuals) and p8 often (~56%) reaching primary coverts, and albertaensis has black on outer primaries reduced, that on outer web of p7 not reaching primary coverts and on p8 only occasionally (~15%) reaching primary coverts. Complicating matters is reported hybridization with Herring Gull in Colorado (Andrews and Righter 1992) and possible intergradation between the two subspecies in Montana (Howell and Dunn 2007). Most of the history of this species in Nebraska has been focused on Lake McConaughy, where it was first reported 25 Jul 1984 (Williams 1984b) and first documented in 1986 (cited above). By 1989 there were 14 observations (Rosche 1994), and since 1990, California Gull had become “almost a permanent resident” (Rosche 1994). Nebraska’s first report of a California Gull is of a bird captured in Howard Co Nov 1934 which had been banded in Montana 17 Jun 1934; no identification details have been published. Through the early 1980s, there were very few reports: Shickley (1966, 1968) reported birds in Lincoln Co 25 Oct 1965 and 19-20 Oct 1967. Rosche (1982) noted four sightings at Whitney Lake, Dawes Co 19 Mar-10 Apr in the years 1974-76 and one at Box Butte Reservoir, Dawes Co 4 Oct 1975; another was reported in Dawes Co 23 Mar 1974. During the 1980s there were additional reports from Dawes and Keith Cos in the period 18 May-19 Aug (Williams 1984a, 1984b, 1985, 1987; Grzybowski 1990; reports 11 and 25 Jul 1984 were considered “astonishing” due to the species’ rarity (Williams 1984b). In addition, there are reports in the 1980s for Cherry Co 21 Mar 1980 and Lincoln Co 18 May 1986. A specimen collected by Hudson in Lancaster Co 19 Mar 1933 (Hudson 1933) is now an axial skeleton, UNSM ZM11152, but Hudson (1956) later retracted the report, concluding that the measurements did not eliminate the possibility of the specimen being a small Herring Gull. Brogie, M.A. 1986. California Gull in Keith County, Nebraska. NBR 54: 77. Hudson, G.E. 1933. A Nebraska record of the California Gull. NBR 1: 61. Hudson, G.E. 1956. Error. NBR 24: 54. Jehl, J.R. Jr. 1987. Geographic variation and evolution in the California Gull (Larus californicus). Auk: 104: 421-428. Shickley, G.M. 1966. Excerpts from letters. NBR 34: 40. Williams, F. 1984a. Southern Great Plains Region. American Birds 38: 929-931. Williams, F. 1984b. Southern Great Plains Region. American Birds 38: 1035-1037.